It was a busy week in the sky above Inwood! It began last weekend when a bright orange Coast Guard Dolphin helicopter passed low over Spuyten Duyvel before heading off in the direction of Yankee Stadium. On Tuesday a pair of Navy F/A-18 Hornet fighter jets conducted a low altitude flyover on the Hudson River. Wednesday two tandem rotor military Chinooks passed noisily overhead about five minutes apart, flying north towards the new Tappan Zee Bridge. Also on Wednesday a massive Air National Guard C130 flew upriver at approximately 2,500′. 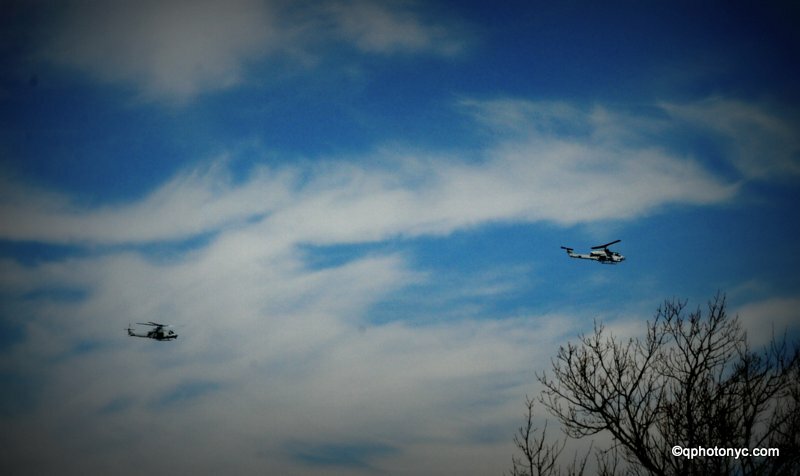 Thursday, a pair of AH-1W Super Cobra helos buzzed Inwood Hill Park just above the treetops around 11:30 AM.